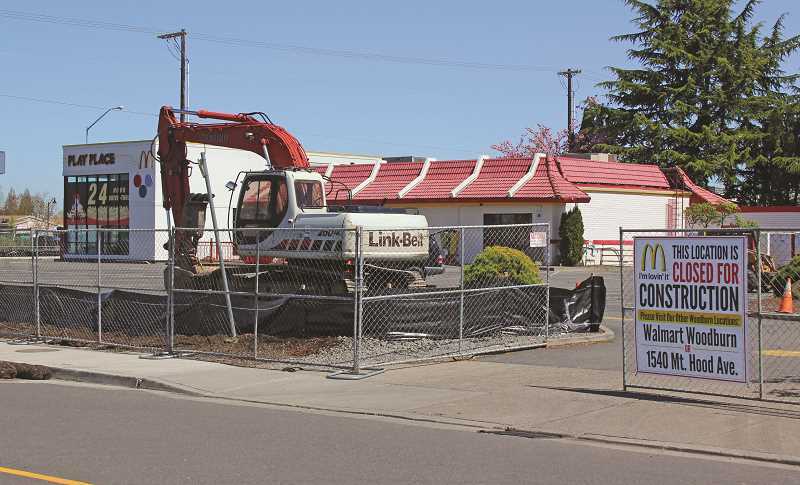 McDonald's in Woodburn is getting a makeover, with the location by Interstate 5 being fenced off for demolition and reconstruction. The 40-year-old building was the first of franchisee Mindy Mayer's locations, making her the first McDonald's franchisee in the Northwest when she bought it Aug. 1, 1990. Today, Mayer owns 14 McDonald's restaurants, from Sandy to Silverton. The location shut its doors and gated off its parking lot April 16, and demolition was anticipated to begin as early as this week. Mayer said the project is anticipated to take 110 days from start to finish, so it will likely be completed by the end of the summer. "We're going to rebuild it completely," she said, adding the new building will include a PlayPlace. In the meantime, local McDonald's enthusiasts can get their Big Macs at the Mount Hood Avenue location next to Bi-Mart, or in the Woodburn Walmart. All employees of the Newberg Highway location have been offered jobs at nearby McDonald's locations. Mayer said she plans to add to the new team when it reopens. "I really enjoy Woodburn; I feel like it's my community," Mayer said.